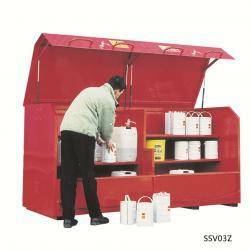 A range of secure Flammable Liquids Storage Vaults designed to comply with the Flammable Liquid Storage Regulations (1972) as appropriate and the Factory Inspection Guide HSG51. These vaults will provide a half hour protection from collapse and the passage of flame. Adjustable vents are fitted that can be opened or closed to meet the requirements of both Flammable Storage (vent closed) and Agrochemicals (vents open). A fully welded unit ensures compliance with the A.P.E.A Construction requirements.The vaults are multi-lockable for high security and fitted with a lift up action lid assisted by gas struts for the ease of the operator. Mid shelves will pivot on models SSV01Z and SSV02Z to enable larger items to be stored on base level. Model SSV03Z has a central partition with 4 shelves. The 2 middle and 2 top shelves fold away and the two top shelves can be partially removed to create a larger space for your storage requirements. Before storage of herbicides and petroleum based products takes place the advice of the following should be sought for specific guidance. Compliant with the A.P.E.A Construction requirements.